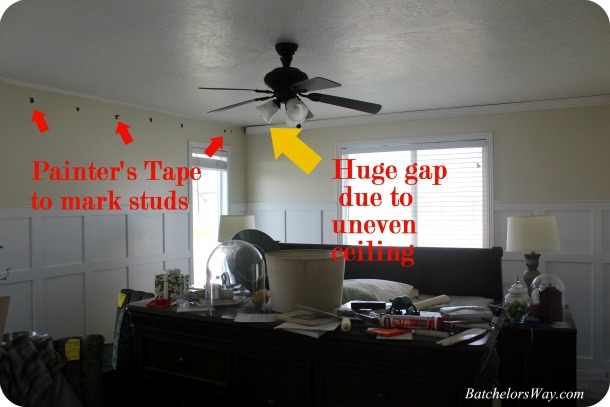 Batchelors Way: Master Bedroom Part 4 - If the Crown (Molding) fits, Wear it!! Master Bedroom Part 4 - If the Crown (Molding) fits, Wear it!! I am still working away at my bedroom. but I can't be too upset cause it's my chillins being home that slows me down. But they are what my life is all about!!! Today I get to talk about my new Crown!! although it is a very pretty sparkly crown!! I'm talking about the crown molding in my master bedroom. Let's start at the beginning. Like most of my stories, it started a few years ago when I was perusing my favorite Restore. I came across 4 really long pieces of crown molding. By long I mean like 16 or more feet long. I paid $20 for it all. Retail for this much crown molding would be more like $125. Can you say $100 savings? That's soooooo the Batchelors Way!!!! I have been storing this crown molding on my plant shelf for 3 or 4 years! Now the time came to use it!! My bedroom is like 15 feet by 13 feet, meaning I could use one board per wall. This also meant this was not a one man or woman job!!! I can not hold that long of a board myself. Les was so willing to help, which proved to be more of a blessing than I would have guessed. Ceilings and walls are not square!!! We started by marking the studs with painter's tape. We then measured and cut the first piece. Using the painter's tape as a guide, we nailed the crown in place. It's hard to see in the picture but there was a huge gap in the one corner due to the ceiling not being flat or square!! I was sure no amount of caulk would be able to make this look good. I spent one whole day debating if I wanted to continue or take it down. Luckily, my husband encourage me to keep going. So we continued on. The corners were the toughest to get lined up. But Les pretty much used his brute strength to get the two boards to twist and line up. Once all the crown was up, it was time for caulking. Whoever came up with caulk was a freaking genius!! 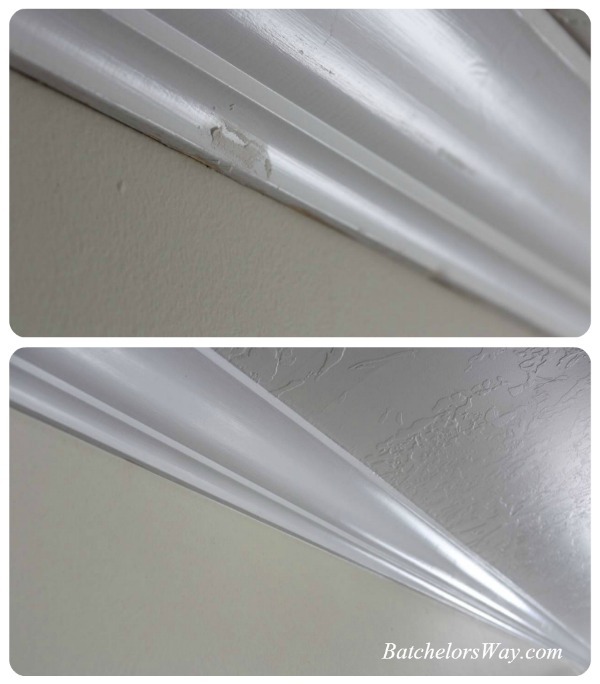 Check out the before and after of caulking along my bumpy ceiling. It's like beauty and the beast! Our very last corner proved to be the hardest. But after filling the holes, some sanding and caulk you can barely tell it's not one piece!! I over fill the nail holes so I don't have to do it a second time when the filler shrinks. Once all those holes were lightly sanded I went back and painted the crown. Normally I paint all my trim before I install it, and then just touch up the nail holes. This time my crown had already been used, remember the $100 savings from the Restore? It was already painted white. We had to clean up the old paint and caulk off the edges before we installed it, but it was worth the $100 savings. Since it was already painted it only took one coat of paint to cover the caulk, nail holes, and scuffs on the crown molding. I have to say, installing crown molding on the ceiling is not for beginners. What tips do I have? 1. Cut your crown up side down on your miter saw. Don't know why it just helps. 3. Don't attach the last 2 to 3 feet as you approach the corner. That way you can twist and move it a little to line it up with the adjacent corner piece. After they are where you want them have your partner nail them in place. 4. Take your time measuring and thinking through each cut. Measure twice, cut once. I'm thrilled with my new crown!! Thanks to my Hubby for pushing through!!! Anyone else have a love hate experience with crown molding? Now I can move onto my curtains and decor stuff!!! So excited this worked out for you. My first major project was crown molding and there was a lot of tears. I redid a lot of pieces, but love the effect. Great job and love the power of caulk. We did crown molding in our last house. It is a pain! Good job, it looks great! Have you tried cutting 5 degree shims for your inside corners? You can use scrap crown to make them. 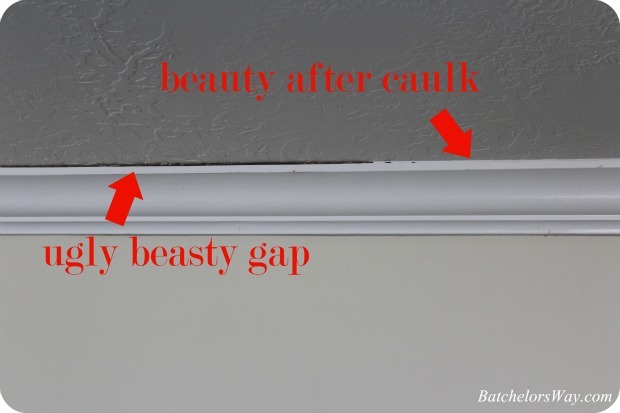 If there's a small gap, just use a chisel to pull the crown off the wall, insert a shim and then do the same to the other piece until the crown molding touches. Then, use the chisel to push the broken off shims up behind the piece of crown a bit. Once you caulk, you never see the shims again the the corners look perfect. I would try shims for the inside corners of the crown Ronda. Cut some 5 degree pieces from the scrap crown. When there is a gap in the corner, just use a chisel to pry the crown off the wall and then stick the shim in there. Do the same for the other piece of crown until they are even and touching. 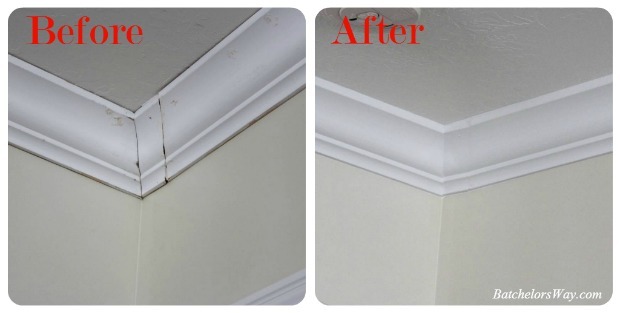 Break the shims off and use the chisel to push the pieces up behind the crown moulding. Caulk the crown and you'll never see the shims again, plus the corner is perfect.